It’s that time of the year again….time for another a-ma-zing birthday party created by Jessica Levitt. If you’ve been reading Half Baked over the years, you are familiar with Jessica by now. But for those of you who are new followers, let me introduce you to one very talented lady! Jessica is a mom, sewer, crafter, designer, blogger and over-the-top party hostess! We are always thrilled to feature one of Jessica’s parties because they are just perfect, down to every last detail. So far we’ve enjoyed Jessica’s Construction Birthday Party, a zoomin’ Race Car Birthday, a Cookies & Milk Party along with the Peaches & Cream Party she hosted for her daughter’s 5th birthday. This year her daughter turned six and celebrated with a day that any little girl would love. 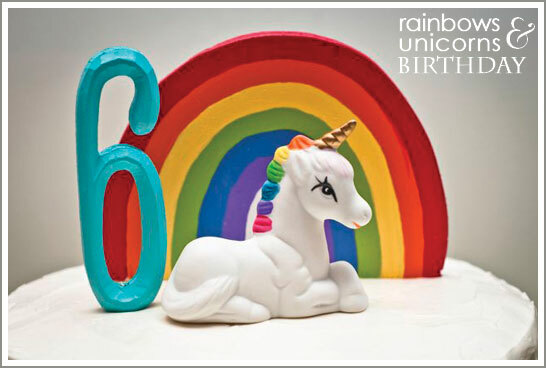 Take a look at this colorful and bright Rainbows & Unicorns Birthday! Activities included face painting, a t-shirt craft project and a treasure hunt for the pot of gold at the end of the rainbow! Guests were asked to come dressed all in one color so together they made yet another rainbow. How adorable is that?!? Like I said before. A-MA-ZING! I don’t ever remember unicorns looking this good when I was a kid! 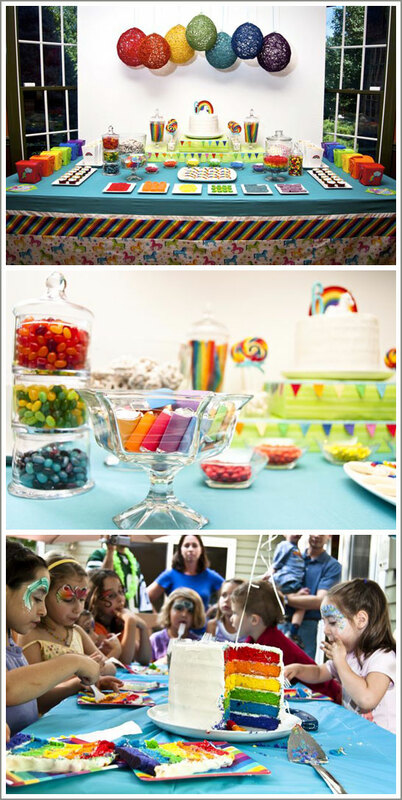 The bright colors, beautiful treats and creativity make this party just spectacular. A huge thank you to Jessica for inspiring us all! You can read even more about this charming party on Jessica’s blog, Juicy Bits. « Site Improvements: Hello Lovely Logo! What a fun party! I just made the Rainbow Layer cake for ST. Patty’s Day and it was a huge hit. I can just imagine the whole party. Very Very cute! Oh my! Could this party be any cuter? Love this! Wish I had a unicorn party like this when I was six!! Love how she continued with the rainbow theme with EVERYTHING! Very cute party and very colorful! Love everything about this party! Especially the yarn balloons. Love this theme. Great inspiration…..
Oh my! It’s absolutely adorable! My girls love unicorns and just might chose to have unicorn birthdays this year. I had the very same little ceramic unicorn cake topper as a little girl myself and I would love to know where you found it! Please, please, please let me know so I can get them for my girls! 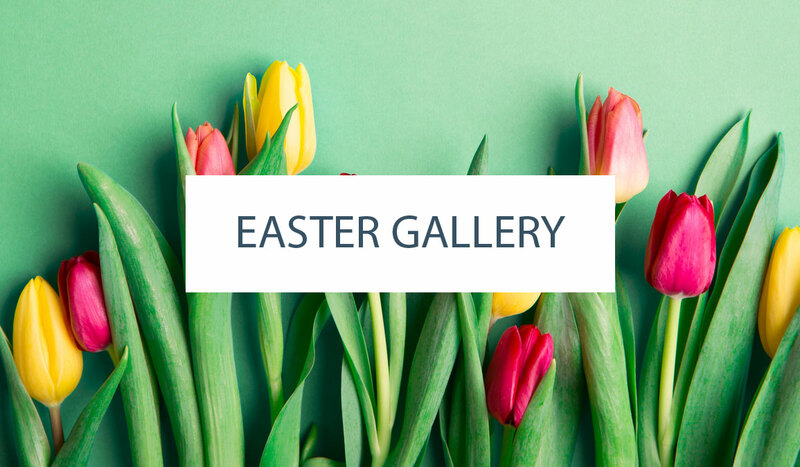 Holly – this party was created by Jessica Levitt. 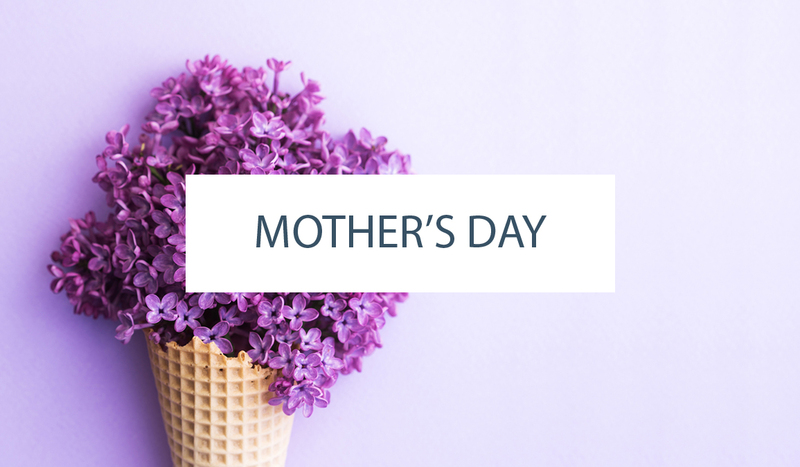 We were honored to feature it on our site! I’m not sure where she found the ceramic unicorn, but below is a link to her site. Perhaps she can point you in the right direction. Hope your unicorn party is a blast! Totally cute. I just wonder if the intense food coloring is healthy for the little ones. I know your post was written several months ago but I wanted to let you know that I am having a rainbow unicorn party this weekend for my daughter and we are trying to use fruits for coloring wherever we can. Like for the cake we are doing the sugar cookies stacked with cream cheese icing and fruit in the colors of the rainbow. We tried coloring the cake with fruit and vegetable purees but the consistency was not right. Although the taste was delicious! Just letting you know it can be done without all the food colorings that are so bad for our children.